This week the Tall Ships came to Boston, as they usually do to help celebrate the 4th of July. It’s a thrilling spectacle; especially since these are ships from all over the world. This year it was also in celebration of the bicentennial of the War of 1812. I’m always interested in the development of a subject throughout the history of art. 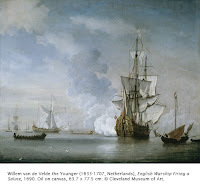 The depiction of ships has a long tradition, especially in Baroque Dutch painting of the seventeenth century. While the basic premise is the same, depicting ships on the waves, the intent between the Dutch artists and the American artists was quite different. 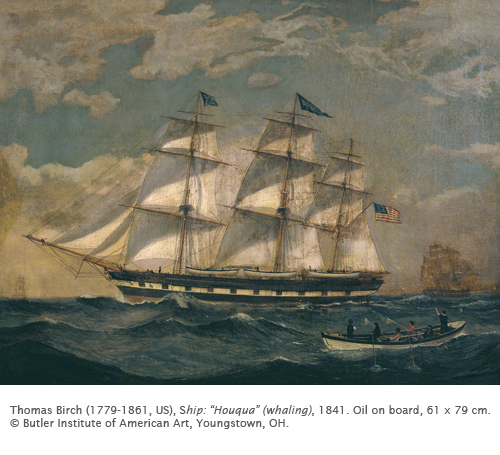 While the Baroque artists were depicting the power and majesty of the sea, American artists depicted ships—primarily on the inland waterways such as Lake Erie or the Hudson River—as a tribute to the commerce and, after steamers were invented, the ingenuity of this fledgling country. 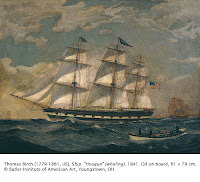 James Bard was born in New York and until 1845 painted marine views with his twin brother John, mostly watercolors. The brothers were most likely self-taught. 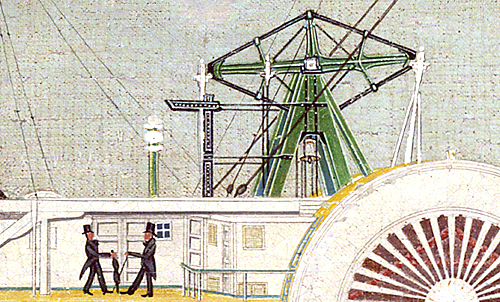 After John died in 1856, James continued a very long and productive career, taking advantage of the boom in steamships, his most famous subject. 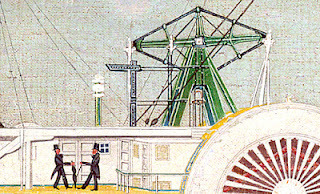 His clients were shipbuilders, owners, and captains. Apparently he frequented the shipyards in order to study details of the vessels there. Thus, his depictions of ships from the Hudson River and in the waters around Manhattan are so accurate in scale and detail that one client remarked that a ship could have been built based on the proportion in Bard’s paintings. 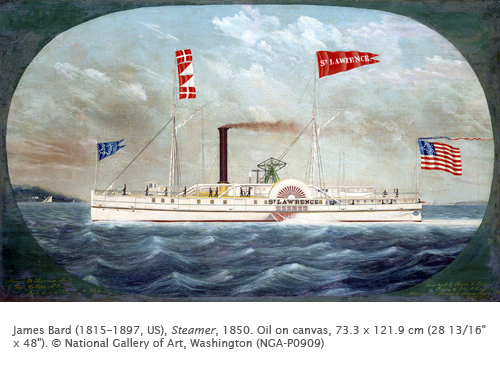 Bard painted over 500 depictions of steamboats, although, based on art critics from the period, his work received little critical notice. Late in his career he became acquainted with the some the other marine painters (see their work below links). As productive as he was, he amassed no great fortune from his work. In a sad irony, both he and his twin John died practically indigent.